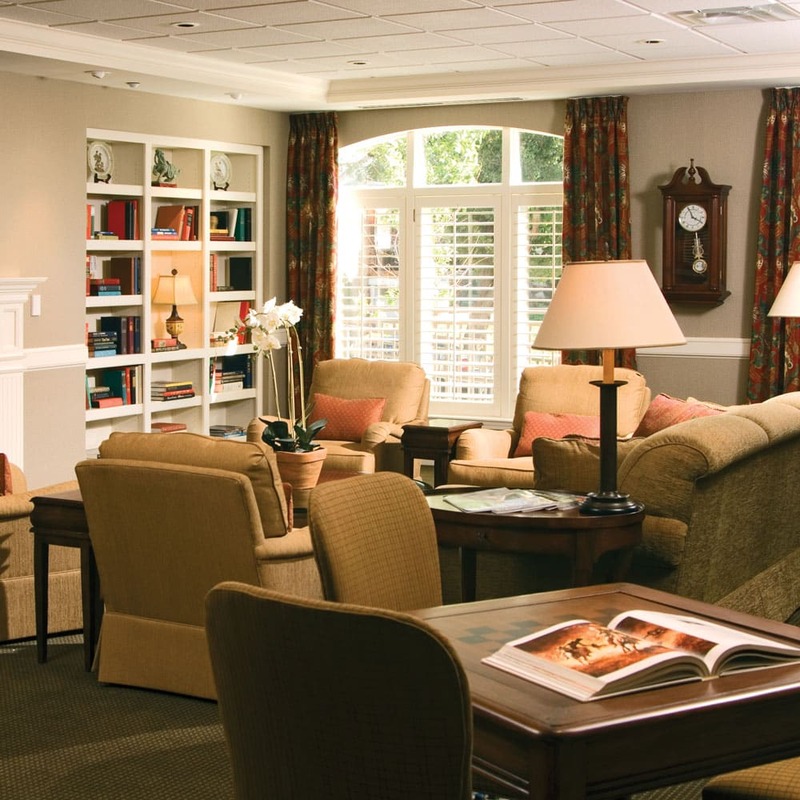 Our residents, staff members, and others familiar us are eager to let you know about the wonderful, fulfilling retirement living at Bishop Spencer Place. Bishop Spencer Place integrates all services into a 1st class package, through great management and attention to big issues and small details. We love Bishop Spencer. You have a dynamic team and precious residents. Resident Bill Buckner loves to host dinner parties here at Bishop Spencer Place in our private dining room, called the Abbey. Below is a brief description of his second dinner party of the year, however it is his eighth party since he has lived here at Bishop Spencer Place. Bill Buckner’s guests gathered in the Madison Living Room for cocktails and wine served with cheese and crackers. They moved to the Abbey where they enjoyed a fresh green salad followed by Kansas wild pheasant which had been shot that season by their host. Bishop Spencer Place Chef Earl Morgan, after conferring with the host had prepared the pheasant with orange marmalade and served it with wild rice and green peas. By request the Chef appeared and was greeted with applause from the guests. After a light dessert of orange sherbet and vanilla ice cream the guests lingered over coffee and talked until it was time for them to go home. They had knowingly braved a Winter storm in order not to miss what they knew would be good company and a fabulous feast. Host Bill Buckner declares that entertaining at Bishop Spencer Place is the easiest (and least expensive) way of entertaining he knows. He would like to give many thanks for the great service from Sara Lavy, Bishop Spencer Place’s Food Director, Earl Morgan, and their courteous and attentive staff from PB&J Restaurants, Bishop Spencer Place’s dining service provider. I want to thank you for taking care of my mother during her recent stay in York Place. I was greatly impressed with the level of care she got there. All of the staff demonstrated high levels of professionalism, medical expertise, and compassion, when caring for my mother. It was a great comfort and relief to know that I could depend on everyone there to be concerned with her care and that any medical problems would be addressed quickly and with the highest regard for her well-being. Although I spent a lot of time with her there, I was confident she would be well taken care of when I was gone. Bishop Spencer Place has a very good reputation and some of the things that stood out to me were the medical expertise from the doctors and nursing staff, the professional attitude of all the staff, the quality of the therapy she got, and the social activities. She particularly enjoyed the musical performances and the pets. I am so glad I found a place where she could be well taken care of near the end of her life and I wish I had found it sooner. Keep up the good work. My Mom became a temporary resident at BSP on March 23, 2011. She had a stroke 3/11/11 and we are trying to get her moved closer to me. Meanwhile, St. Luke’s Hospital moved her to your facility. I knew nothing of BSP prior to 3/23/11. But I want you to know that I am so thankful for the employees with whom I have interacted since then. The nurses, Pat and Carla, who both called me about the two times that Mom fell, were kind, businesslike, and helpful. I appreciate them. The receptionist was the first personal contact I had with BSP and she, too, made me feel that Mom was among kind people. Jennifer, from bookkeeping, called to tell me that Mother’s supplemental insurance no longer existed (Mother cancelled it using Alzheimer’s reasoning). Jennifer was kind and helpful and never made me feel bad about unknowingly giving her the policy number that no longer existed. It is because of Jennifer that I was able to contact another insurance policy and begin the process of obtaining another supplemental insurance policy for Mom. I especially want you to know how helpful Lee Anne has been to me. The first three days that Mom was at BSP, I could never reach Mom by phone no matter what time of the day I called. I had left Kansas City thinking Mom would be flying up within days so I did not even know about or see BSP and I was uneasy. Lee Anne checked Mom’s phone for me to make sure it was working and even went to Mom’s room to answer it when I test-called to reassure me that the phone was working. She recommended a time when Mom is usually in her room and now I am able to talk to Mom nearly every afternoon. Lee Anne went above the call of duty and took pictures of my Mom and the rooms where she frequents (dining hall, physical therapy room, hall way, etc) and then emailed them to me. I didn’t ask for that, she did it on her own. I cried when I saw the pictures. It helped so much. I have had several questions and Lee Anne has been so good to quickly respond by phone or email to give me answers. I am so thankful. This is an emotional time for me but it is made better knowing that Mom is being treated with kindness and respect by you folks at BSP. Thank you for taking care of her and thank you for ministering to her family (me) as well. After the beautiful memorial today I stopped and spoke with both of Ruth’s nieces, before they left for the cemetery. I was so glad that I did. They both gave me huge hugs and told me how much she loved the art class, how much she loved painting too. We talked about what a stellar painter that Ruth was too. They really appreciated all that we did as a group, to enrich her life. I had three separate families tell me today that they have been around other retirement communities, and BSP is by far the best. What wonderful words to hear! All of you should be proud of the great services you provide this community. Let’s promise each other to continue giving our best and never take for granted all the blessings we have at BSP. Thank you for being part of the best retirement community in Kansas City! Thank you — All of your staff is caring, kind & bright. They & you deserve the best. I am grateful. I am grateful for the regular exercises given three days a week at BSP with expert trainer Jo, to strengthen bones. I am grateful for the joy of fellowship in the Bistro and dining room, halls and apartment areas. I am grateful for the care from all the staff and the joy of greeting them in the halls with the four letter word “WORK”. I am grateful for the clergy, David and Harry, who gather in the chapel every Thursday morning, and for the Bible study and care given by Chaplain Linda for us residents. And I am grateful for the spirit of care given me from my bike accident and by the staff’s quickness — for sure nurse Sharon and driver Pierre — to see the love of the Lord in all your activities. So I have learned and experienced what a good and gracious place to be as life unfolds and continues to roll on to new challenges, fellowship and care for one another at Bishop Spencer place. A blessed place we have here. On behalf of Karen, we both thank you for the excellent care she received the two months she was there in rehab. All of the many people on staff we encountered were pleasant, professional and willing to please, It’s amazing that all of you maintain such a positive attitude with your difficult roles. Thank you for your patience with both of us! I wish to call your attention to a particularly outstanding service rendered to me and my family recently relating to the memorial service reception for my wife, Joy Godbehere Bates, and a family dinner held in the Westport Room at Bishop Spencer after that service, all on January 12, 2013. Moving my parents into their new apartment home is going well and my whole family couldn’t be more thankful! What a transition it has been! We have had had highs and lows. Your Move Management Services have been wonderful! Linda, from Gentle Changes was a God send, and the maintenance men did a fantastic job helping my parents hang their pictures! We wanted to take a moment to thank you all for your kindness and support during our mother’s final days with you all. Your kind support of us all and your loving care of our mother was very much appreciated. She was always most grateful for your care. We realize our presence there during her final hours way have been a bit disruptive but you all were most kind to us offering us food, drinks and most of all our privacy. Thank you all so much! I was blown away just sitting in the lobby watching the residents ask the front desk person for various things and how quickly their needs were met! A friend and I came to Bishop Spencer Place last week to say good-bye to our friend in York who recently passed away. We were very impressed with the facility and believe the Hilton would be envious. But more than the physical plant, we were impressed with the friendliness and compassion of the personnel. After dutifully standing our vigil for a couple of hours, we decided to go have a drink, and were delighted to enter the small bar on the premises. We were served by a pretty young lady named “Mary” who was a shining star. She would not accept a tip, although we tried. I didn’t get the names of other personnel, but would put them all into close to Mary’s category. My Dad recently moved into his Independent Living apartment at Bishop Spencer Place on August 8th and he is doing so well. He really likes the way the apartment looks, and seems very happy. He loves that people are stopping by, and feels comfortable leaving his door open during the day. My family is easing back from coming by each day, as we really want him to get out and get used to the rest of the community. I am so pleased with how welcoming and nice everyone has been! We would like to thank you all for what you all did for our father with his stay with you all. He could not say enough about you and the care he got from you. He said it was one of the nicest places he had seen and stayed at. Your staff was great & helpful! !